Welcome to the website for the Peyton Heart Project. A global project created to help end suicide and bullying and the stigma surrounding mental health issues. The Peyton Heart Project was inspired by several stories including that of a 13-year-old boy named Peyton James who died by suicide in 2014. During Peyton’s young life he had experienced a tremendous amount of bullying by his peers. Many of us know far too well what the negative effects of bullying are on a child and how difficult it can be to believe that it will ever get better. Far too often bullying leads to depression, anxiety, and other mental health issues. Sometimes these issues can increase the likelihood of suicide. The delicate hearts, each one made by hand and each one representing the delicate heart of a life lost to suicide, have various inspiring quotes attached to them, along with our social media information. The hearts are placed in public places around the world for people to find during their everyday lives. We hope the hearts cause people to stop for a moment and reflect on a young life lost to suicide, on bullying and on the fact that everyone’s life matters. We want to leave people with a feeling that there is still good out there in the world and we would like to inspire others to join us on this mission of kindness. If you would like to help spread the Peyton Heart Project and its message in your town, please read through the Frequently Asked Questions (FAQs) to learn how you can become involved. Most of your questions can be answered there. I would like to thank Peyton’s parents, David James and Jacki James, for allowing me to use Peyton’s name for this project. 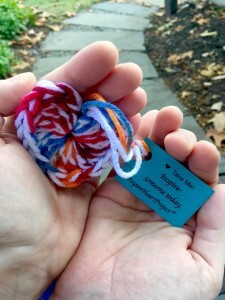 and tag the photo with #PeytonHeartProject and the city/state/country you found it in. Our ongoing effort is the collection of hearts in bright, cheery colors (not black) with regular English tags. See a list of all our events HERE.